Carmelo Porrata Gonzales looked out on the pasture with the expression of a shop owner who has found his store burned to the ground. He pushed his foot into the ground and watched the water pool around his shoe. Then he poked the dirt with the tip of his machete as he explained that the land around him was infill – soil tossed up, put back, and seeded with grass after a real estate development project. Porrata has lived in Caimito, a craggy neighborhood on the edge of San Juan, for 28 years. The developers who bring strip malls and luxury condos to Caimito often dump dirt and trash into the valleys of the río Piedras watershed. Porrata has been a witness to this kind of environmental destruction for over a decade now. He says that illegal dumping began in 1999. First, people watched their local river fill with trash and sediment. Then the water turned dirty, previously unseen shades of brown. Streets had to close after heavy rainfall because the water couldn’t drain. The people of Caimito came together to demand better practices, and they were able to stop the dumping. Porrata has recorded changes in the river for years. This photo says, “My property”. Photo credit: Carmelo Porrata Gonzales. View his full set of photos. But new developers with new projects have since come in, and they dump their refuse as their predecessors did. Caimito finds itself facing the same battle it already fought. This time around, Porrata feels more alone. He’s filed official cases and complaints over the years, and the government has validated him, but the dumping continues. “What is the point of having a regulation if no one has to follow it?” he asked. Seventy percent of the rivers in Puerto Rico do not meet the Environmental Protection Agency’s standards. Only 7% of the land in Puerto Rico is protected, versus 25% in the United States and 54% in the neighboring U.S. Virgin Islands (according to fideicomiso.org). At the current rate of development and deforestation, the entire island will be consumed in about 70 years, according to discussants at an MIT Conference on Puerto Rico. Beyond illegal dumping, deforestation has altered the flow rates and pathways by which water enters and leaves the río Piedras watershed. Now Porrata is of the mind that it would take something at the level of a movement to save the river – some collective human will to protect it. Photo credit: Carmelo Porrata Gonzales. View his full set of photos. The río Piedras watershed is big – forty-nine square kilometers wide – and thousands of San Juan’s 400,000 residents live in it. In 1891 Puerto Rico’s Spanish governors built an aqueduct there that provided drinking water to much of San Juan until the mid 1980s. Gladys Morales, who lives a few miles downstream from Porrata in Barrio Venezuela, can see the aqueduct’s old water storage tank from her house. Morales has lived in Venezuela since she was 6 months old. She has short grey hair and eyes full of energy. 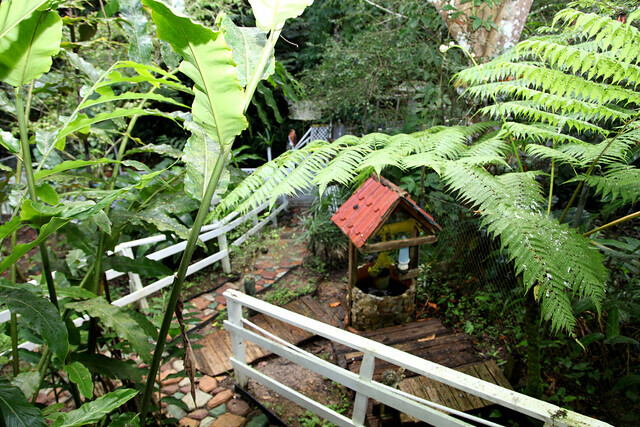 Now makeshift homes surround the old tank, and tropical flora appear to swallow it up. The aqueduct – beautiful but also defunct – and its surrounding lands came under the control of the Fideicomiso de Conservación (Conservation Trust of Puerto Rico) in 2005. The Fideicomiso is, in structure and function, much like the Audubon Society: it restores troubled but stunning properties, some of which become available for public viewing and education. 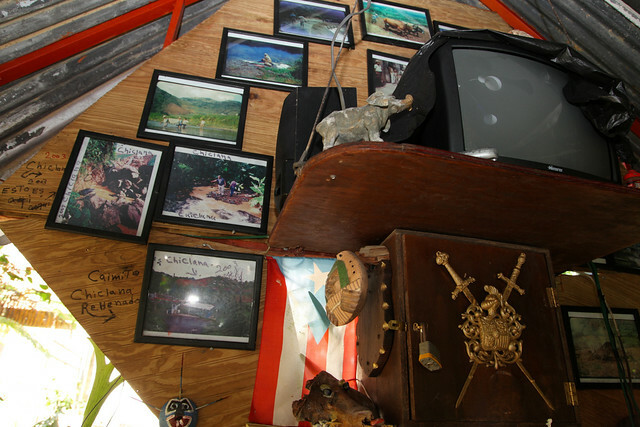 The Fideicomiso has been a leader in conservation in Puerto Rico since its inception in 1970. The río Piedras watershed, however, presents the Fideicomiso with a dynamic it hasn’t dealt with before: a city. Science has taught us how to restore polluted land and water, but many environmental organizations are just now learning how to work with natural resources and people at the same time. 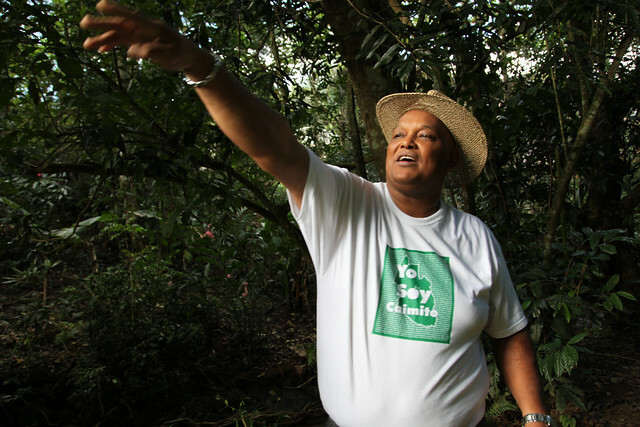 Juan Cruz is an environmental activist in Caimito, San Juan, Puerto Rico. These photos are of Cruz at his home near the Chiclana creek. He is fighting to save the río Piedras wastershed from pollution and dumping. Photos by Nicole Salazar. Cruz in his backyard in Caimito, San Juan. Framed photographs of the Chiclana creek in Cruz’ house. Cruz built a set of stairs behind his house, leading to the river. See the full photo essay of Juan Cruz’ home. Not unlike any other place, the people along the river have done work to make their neighborhoods better places to live. Some of that work has been environmental, but residents have also dealt with education, drugs, small business development, and infrastructure over the years. An environmental issue like clean water access is not separate and distinct from an issue like education access in Barrio Venezuela. The two have been entwined, and also enmeshed with the many other factors that contribute to a healthy community. Channelization is a process by which winding rivers are redirected or straightened through human intervention. Rivers have been channelized for different reasons: to create deeper waterways for boats, to prevent floods, and to increase agricultural land. Results have been controversial. The U.S. Army Corps of Engineers famously channelized the Los Angeles River after a severe flood in 1938. The city’s river is now encased in a 52-mile stretch of concrete. After a series of significant floods in the 1980s, the Army Corps of Engineers proposed channelizing the río Piedras. The process would have involved redirecting certain tributaries of the river, concrete encasements, and bridge replacements. In 1984, the estimated cost of the project was $235.5 million. Since that time, though, both the Fideicomiso and the University of Puerto Rico have developed alternative proposals for managing the watershed. In January of 2012, a class of ten MIT City Planning students joined six students of the same discipline at the University of Puerto Rico to further those efforts. They had been working together since September of 2011. The final product of their research was to be a report (in Spanish and English) for the Fideicomiso detailing what steps the organization could take to restore the río Piedras to a focal point in the city. When the students met in San Juan in January, they coalesced on a people-centric approach. How do the people who live along the river relate to it? Click on the map to view it in interactive form. See photo essays, video tours of the river, and profiles of its residents. Porrata welcomed four students and me, an assistant to the course, to his front patio on January 17th. His wife brought out a fruit plate, then cold drinks, and finally Porrata’ photo collection. He explained the photos as he passed them around. Each photo had a hand-written date on the back, and on several he’d made careful notes describing the significance of the image. Two days later, he took the students on a tour of the stream in his photos. He hacked a path with his machete as he led eight people down towards the riverbed, explaining the land and the destruction it has suffered as he went. Though insects were making lunch of their legs, the students listened with intent. They filmed his tour and asked every question they could think of. Two other groups of students were conducting similar interviews and taking similar tours over the length of the river. They invited the people they met to the final presentation of their research. On February 3rd, people who live along the river; representatives from the Fideicomiso, environmental NGOs working in the watershed, and government agencies; and the Puerto Rican donor who made the entire project possible met at the University of Puerto Rico to hear the students’ findings. The students recommended that the Fideicomiso invest not just in conserving land and restoring historic properties, but also in the organizations and businesses that keep riverside communities alive. They suggested a co-management strategy, by which local organizations share in the conservation process through planning environmental protection activities, designing educational programs, and developing the storytelling effort. Porrata came to the meeting and spoke. He was eager to continue the work, and continue talking with the Fideicomiso. He is a breed of environmentalist little recognized, but ubiquitous in the parts of the world where construction, resource extraction, and other profit-making endeavors bear down on land. He understands the systems at play better than the experts and advocates he’s turned to for help in the past. Article by Alexa Mills. Profile of Gladys Morales and related text by Patricio Zambrano-Barragán (full profile available here). Additional reporting by Alyssa Bryson. Photos and video by Nicole Salazar, Carmelo Porrata Gonzales, and Jody Pollock.